‘Can you see the cow in the sky, up above the clouds?‘ the FYO said as we drove up the road. 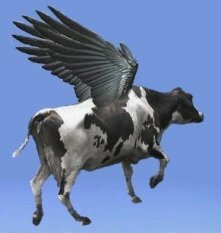 ‘The cow in the sky gives you directions. If it moos, then you turn left.‘ ‘And what if it doesn’t moo?’ I asked. ‘Then you don’t turn left.‘ Though there was a smigin of logic in this, I could see that if I obeyed the cow in the sky I would be condemned to drive anti-clockwise for ever. ‘Doesn’t the cow give any other instructions?’ I asked. ‘Yes. If it wags its tail then you go backwards. If it nods its head you go straight on.‘ I’m almost embarrassed to admit that I sat there working out the various permutations of this, like what if it wagged its tail and mooed, or mooed while nodding its head. I also knew that I had come across logic like this before. It was just like the instructions that came with the MFI flat-packs.